196 pages | 2 B/W Illus. 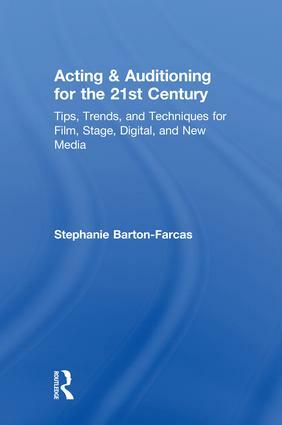 Acting & Auditioning for the 21st Century covers acting and auditioning in relation to new media, blue and green screen technology, motion capture, web series, audiobook work, evolving livestreamed web series, and international acting and audio work. Readers are given a methodology for changing artistic technology and the global acting market, with chapters covering auditions of all kinds, contracts, the impact of new technology and issues relating to disabled actors, actors of colour and actors that are part of the LGBTQIA community. Chapter 1. How to use this book and why now? Chapter 2. Acting for film and the variations of film. Chapter 3. Acting for stage and musicals. The basics. Chapter 4. Before any audition. Chapter 5. The audition. Film and TV. Chapter 6. The audition. Commercials, Industrials, National Calls. Chapter 7. The audition. Voice overs, narration, anime, animation, audiobooks. Chapter 8. The audition. All the New Media. Chapter 9. Auditions for stage and with Shakespeare or Verse plays. Chapter 10. The callback. The cold read. The screen test. Improvisation. Chapter 11. The Art of the self-tape for stage or film. Chapter 12. On the set. What you need to know. Chapter 13. On the stage. What you need to know. Chapter 14. Contracts. Local, national and International. Chapter 15. Further artistic career options in the new century with new technology. Chapter 16. Actors of color, those with disabilities, those in the LGBTQIA community. Chapter 17. You as an artist in the midst of changing technology. Stephanie Barton-Farcas is the Founder and Artistic Director of Nicu’s Spoon Theater Company (www.spoontheater.org), based in New York City and Hawaii. She is also the co-founder of the Disability in Cinema Coalition and sits on the board of Identity Theater Company. She is the author of a previous book, Disability & Theatre: A Practical Manual for Inclusion in the Arts (Routledge, 2017).